My videos have been on my site for a long time. 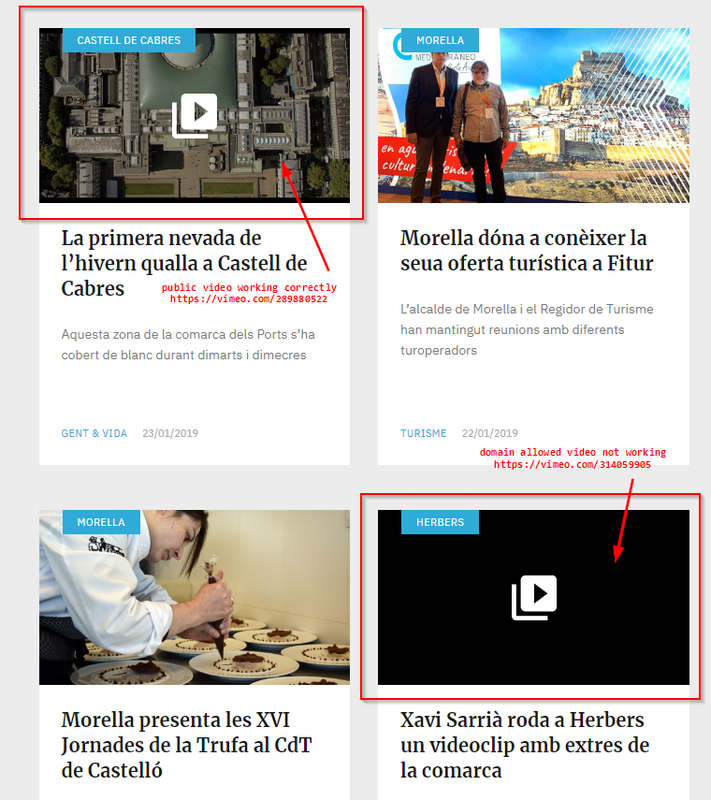 After updating WP and DIVI and ARVE last week the video thumbnails no longer show on the page. I ran into that problem; if you have pro under the option for Inview Lazyload choose “no” and save. Same problem here. My client publishes private videos that only allow inserting to some domains. Some time ago those private videos’ thumbnails were perfectly displayed using ARVE Pro. Now they went black. I have tried to go some Arve Pro versions back: 4.2.4 and 4.2.2, which are the ones listed on your downloads area. No luck. Below you’ll find a link to a screenshot showing one of my client’s private Vimeo videos (https://vimeo.com/314059905), this one allowing your domain nextgenthemes.com to intert it. Please could do some tests using that video and let me know if there is something we can do to bring back the thumbnails? This has to do with your privacy settings for the videos. 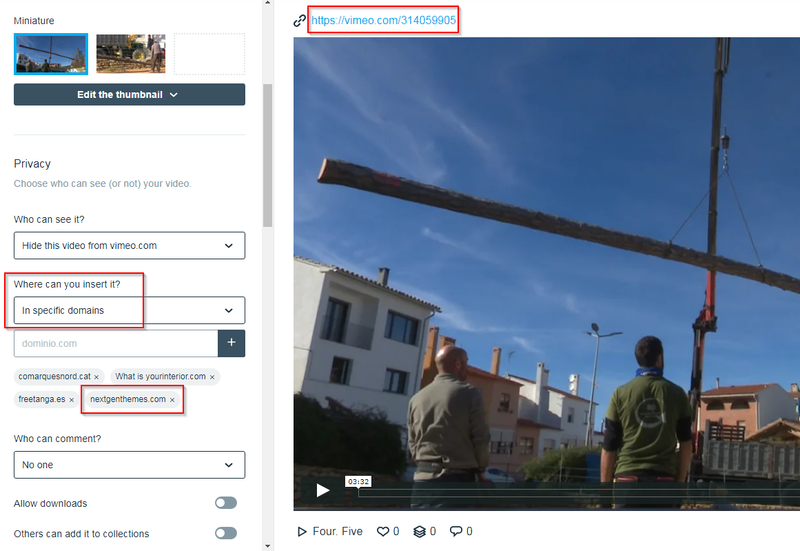 You have to either make the videos public otherwise the plugin can not read the thumbnails or you can also manually upload and use thumbnails loaded from your site instead. I also noticed you use the old shortcode format, I plan to deprecate it at some point, it still is supported but I recommend you switch to the new all in one [arve] shortcode. The autoplay is not needed for lightbox mode as it will never autoplay on pageload and always try to autoplay once the lightbox opens. Grow is a feature specific to lazyload and has no effect on lightbox and is not needed in that case. Thanks Nico, but the video settings are viewable on my site. They have been viewable for 2-3 years. I do not have another idea. I know for a fact that Vimeo is not returning thumbnails for your videos as they are set to be only embedable on your site or other video privacy setting on Vimeo. I am not a expert on those but I am pretty sure this is why. They may have changed something with their APIs lately. Is it so important that this privacy setting are enabled? Can you try to set a video public (just one for testing if) it will take about 24h if you use the default cache setting of ARVE for it to try to get the thumbnail again and if I am correct. If that privacy setting is important to you, again you can manually upload thumbnails and make ARVE load it directly from your site instead of getting it from Vimeo. To be specific, I can not go to https://vimeo.com/116435272 and see a video. This is because you set it to private and this is the reason the plugin can not read the thumbnail like for public videos. I also updated my first answer above telling you about the new shortcode format you should use. Please read that. It will not fix anything but going forward it would be best if you not use the outdated format. I am not totally clear what you are saying here. I did this. Now anyone can put the link in any browser and watch my video. I will check tomorrow about the thumbnail, not sure yet. 2. My alarm is that now the video can be viewed by anyone without paying to be on my site. Am I understanding you? 4. Do I need to add ARVE’s domain for embedding on Vimeo? If yes, what would be the link? 5. Why has this changed from the last 2 years using ARVE and private videos? The thumbnails have always appeared. It is strange that a few of the thumbnails still appear?!?!? 6. I have 1400 videos on 2 sites! That is a LOT of work to change all the links! Seems I must do it and I need this to be really right. 1. I am saying that will probably fix it. 2. I did not say you must do so, I did not know people have to pay to see the videos on your site, the link you gave me had videos without me having to login or pay anything so they are public on your site. 3. Public is public yes. 4. No that will not work. But can you give me a video where you set everything to private but add nextgenthemes.com to the allowed URLs so I can test with it? 5. I do not know, like I said its likely that vimeo changed some of their APIs. And yes its very strange that the last video on the link you gave me has a thumbnail. Can you give me its exact shortcode? Are the privacy setting for it different that for the other videos? 6. I did not say you must change the shortcodes, I did not know you have 1400 videos. As for the shortcodes I will give you a automated solution later. I try to find a solution for the thumbnails to work again. But it will take some time. I have the exact same problem, and it’s extremely urgent. The privacy status of my videos is NOT the problem – they are all public! All new posts have broken thumbnails. And some old ones, too. What caused the thumbnails to break? You used a answer on someone else’s question. And ignored the text that says “Please do not use answers for comments. Answers are supposed to solve (or try to) a question, everything else is a comment.”. Next time use a comment or open a new question. That video is domain or otherwise restricted and I cannot play it to test it on my domain. Does the video actually play but has no thumbnail? Domain restricted videos likely will not get a thumb either. You have to either make it totally public and unrestricted or you just have to manually set your own thumbnail on the Shortcode. @everyone. If your video is private (or domain restricted) there is still no other solution then to set the thumbnails manually. Sorry I already said that b4. If it worked previously then it was a change on Vimeos end. There may be a (complicated) solution in the long run but I can not promise anything at this time.